Vogue Knitting Live! Chicago 2014 – Hello, Wonderland! My first day was Friday. Registration was a *SNAP*; I showed up bright and early and my badge had already been mailed. All I needed was a lanyard and a brochure from the express registration table. My friend had a morning class, although I only had an afternoon class, and as the marketplace was not yet open I sat around in a lounge area in the gooooorgeous hotel and chatted with other knitters! Both years that I’ve attended, it’s been really fun to be a part of such a welcoming atmosphere. I’ve been talked to and joined by all sorts of people I don’t know, and everyone has been very pleasant and cheery! After her class, we headed out to a brief lunch and then chatted before our afternoon classes. 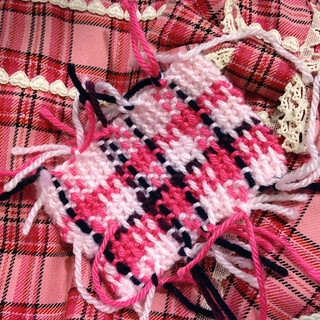 I took Bavarian Twisted Stitch with Franklin Habit. I was very excited for this class mostly because I adore Franklin, although the technique and traditional garments using it also interest me. 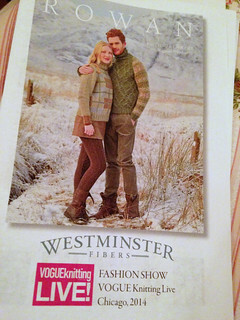 I’m a bit tempted to make some traditional twisted-stitch socks for my husband, not that he wears lederhosen. I actually realized I had used this technique on a pair of socks for myself, although it was not labeled as a particular style, just one more cable among a number of cables of different types. It really does have an interesting high-relief look! After class, to the marketplace! It was finally open and we were more than ready for it! My friend had a dedicated mission, carrying her guidebook around and circling booths that interested her. 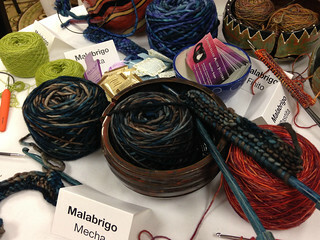 (We also popped by the yarn tasting area!) She had a particular shopping list of things she was hoping to find. I wasn’t looking for anything in particular other than a size N/10mm crochet hook. I almost bought one, too, but I’m particular about crochet hook handle shape. 10mm is proving to be very hard to find with a flatter handle as I prefer. 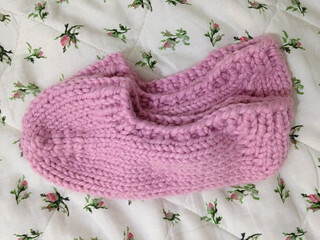 I didn’t pack very well on Friday morning, so I brought only some size 10 DPNs and leftover pink Wool-Ease Thick & Quick from some Christmas projects. I wound up making these slippers during the day, modifying the Tiny Owl Knits pattern Amy March’s Slippers so they would not have live stitches threaded with yarn, but would instead be bound off. They’re likely to wind up tucked in a stocking for Christmas. On Saturday we returned bright and early for more classes! We both had two-part classes on Saturday; morning and afternoon 3-hour sessions that were technically one 6-hour course. Mine was Continental Immersion, and boy did I need it! We spent the morning learning the knit stitch, moving on the purl stitch just before breaking for lunch. It took me all 3 hours to learn those things, and I am still in need of practice. I’ve continued using that new skill in the two days since the class, but it takes a lot of effort to do something unfamiliar. I think I am getting a bit better, though! Progress!!! We watched the Rowan fashion show before lunch. We were both very hungry, but the fashion shows were not terribly long and it seemed like we could last to sit through one. Lately I’ve been really enjoying Rowan yarn. Many of the garments in the show were not necessarily my taste, but there were design elements I really enjoyed (particularly some of the Martin Storey pieces). I was definitely glad that we took the time to see it, though; we didn’t make it to any of the other fashion shows, and I wanted to include at least one for a “full experience.” After that, lunch and then back to class! After class, we headed to the panel Men at Work–How They Turned Their Passion Into Their Careers. Michael Franzese, StevenBe, and Franklin Habit were very engaged and interesting speakers. I only wish the audience participation had been slightly different. There was a limited time for questions and only a few males in the audience, and I felt that several of the questions asked had very little to do with the panel’s basis: what is it like being a male presence in a female-dominated industry? That said, I was surprised to hear that none of the panelists felt it had been a detriment for them; each stated that they received an element of novelty interest simply because they are male, and that helped get a first look. Continuing to particulate and thrive was another story. We snuck out for lunch, returned to check the marketplace one more time (my friend has a dream of The Perfect Red Sock Yarn which may not actually exist in this universe; I was able to pick up needles to work on the kit I bought yesterday–my interchangeable sets don’t go down small enough for the sizes required), and then waited for the yarn toss! I wasn’t really sure what to expect, and for a while there was some tension in the crowd waiting to be let in for the yarn toss. I am not terribly aggressive to get free things, and I was concerned it would turn into something very aggressive. Thankfully, it was very fun and fairly low-key. I cannot catch anything thrown for the life of me, but a Rowan Fine Art skein landed near my feet and became mine. I look forward to working with a yarn I might not have purchased. 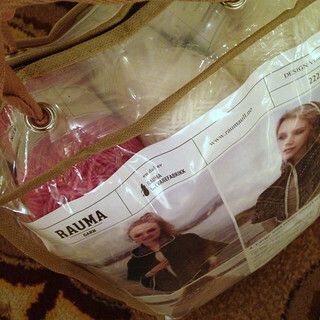 This entry was posted in Knitting and tagged Chicago, event, finished project, knitting, slippers, Tiny Owl Knits, Vogue Knitting Live!, Vogue Knitting Live! 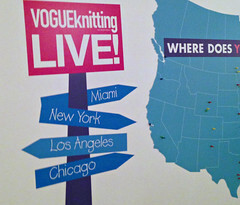 Chicago, Vogue Knitting Live! Chicago 2014. Bookmark the permalink.